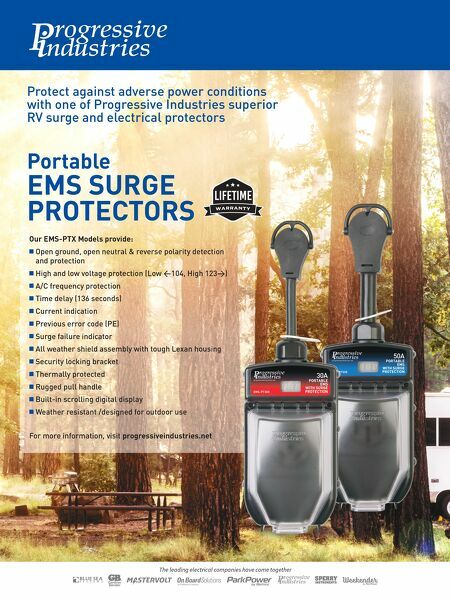 rv-pro.com November 2018 • RV PRO • 65 pleasing to both men and women. I also think that is one thing the market is lacking – the woman's touch – so that's another thing we're trying to bring to the market through our brand." The pieces fell into place nicely over the past two years. Meanwhile, East to West got an added boost this summer when the Elkhart County Council granted a tax phase-in for East to West's $6 million building project. The Eco- nomic Development Corp. of Elkhart County recommended a five-year tax phase-in for real estate, based on how the project scored in its metrics. The county's declaration makes the property eligible to receive tax abatement on real estate improvements. Council members expressed interest in the project when the tax request came before them this past summer. "This is a pretty exciting project as far as I'm concerned because ... it takes a new look at the way the manufacturing of the recreational vehicles is being done," says County Councilman Dave Foutz, referencing the streamlined production process. "I think this could be a watershed event here in this area, on how we do business. I think it's really exciting to be a part of it." First Year Goals Rees has set some reasonable goals for this first model year. "Right now, I want to establish our dealer network and improve upon our initial launch. We're taking our consumer-dealer feedback very seriously," she says. "We're now a division of Forest River, but we're so small we can implement changes right away, so one of the things my team and I are doing is calling dealers and asking them: What do you like and what do you not like about East to West and Della Terra? We're implementing their suggestions as seamlessly as possible. "We tried to bring some upgrades to the Expo that dealers said we could improve upon. 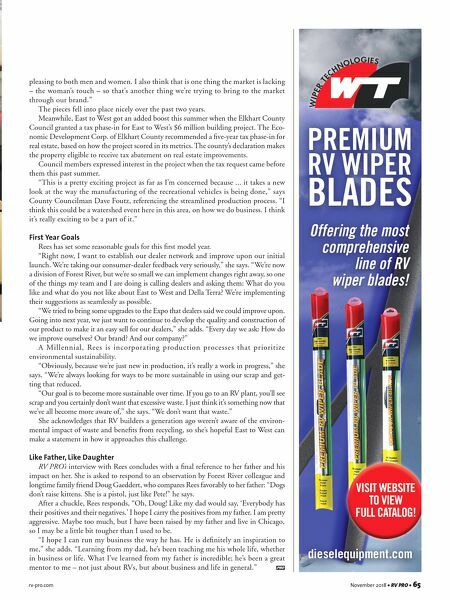 Going into next year, we just want to continue to develop the quality and construction of our product to make it an easy sell for our dealers," she adds. "Every day we ask: How do we improve ourselves? Our brand? And our company?" A Millennial, Rees is incorporating production processes that prioritize environmental sustainability. "Obviously, because we're just new in production, it's really a work in progress," she says. "We're always looking for ways to be more sustainable in using our scrap and get- ting that reduced. "Our goal is to become more sustainable over time. If you go to an RV plant, you'll see scrap and you certainly don't want that excessive waste. I just think it's something now that we've all become more aware of," she says. "We don't want that waste." She acknowledges that RV builders a generation ago weren't aware of the environ- mental impact of waste and benefits from recycling, so she's hopeful East to West can make a statement in how it approaches this challenge. Like Father, Like Daughter RV PRO's interview with Rees concludes with a final reference to her father and his impact on her. She is asked to respond to an observation by Forest River colleague and longtime family friend Doug Gaeddert, who compares Rees favorably to her father: "Dogs don't raise kittens. She is a pistol, just like Pete!" he says. After a chuckle, Rees responds, "Oh, Doug! Like my dad would say, 'Everybody has their positives and their negatives.' I hope I carry the positives from my father. I am pretty aggressive. Maybe too much, but I have been raised by my father and live in Chicago, so I may be a little bit tougher than I used to be. "I hope I can run my business the way he has. He is definitely an inspiration to me," she adds. "Learning from my dad, he's been teaching me his whole life, whether in business or life. What I've learned from my father is incredible; he's been a great mentor to me – not just about RVs, but about business and life in general."